World Integration tackles the tricky task of incorporating world-building details into a science fiction or fantasy novel. This can present an interesting dilemma for genre writers. How can information on a fictional world be delivered to readers in a way that is natural to the storyline? How can important details be shared without bogging down readers in pages and pages of boring exposition? This is where World Integration will help. Writers will learn valuable techniques for weaving world building into a genre story, as well as the pros and cons of each technique. All methods are accompanied with examples from published works. This book is for all science-fiction and fantasy writers looking to improve and enhance world building in their novels. Writer's Toolbox is a how-to series dedicated to helping speculative fiction writers improve their craft. 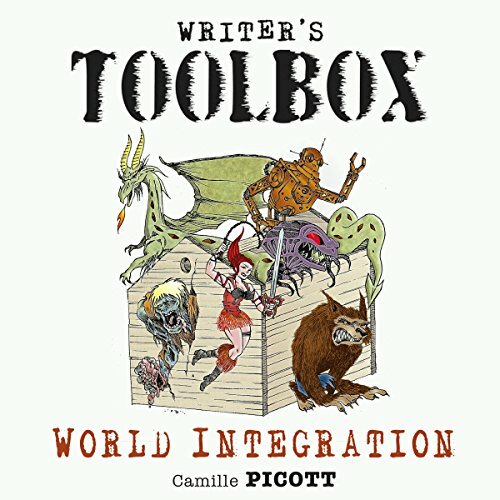 These audiobooks are created by Camille Picott, an award-winning speculative fiction author. It was great not only hearing, in detail, better ways using the tools that I already use, but also in learning of other methods that I can implement. The whole thing was very short, I was able to get through it with two car-rides, but it was an invaluable nugget of information. Definitely worth keeping in my toolbox for later uses. Would you listen to World Integration again? Why? I found this a really quick and interesting guide to help writers who are struggling to find ways to integrate their world building into their novel or short story. It had some very good tips and I came away with a lot of great advice. I must stress that this isn't as helpful for those looking for advice on how to begin world building for their story, but for those that have maybe already done a lot of background work but are struggling to find ways to seamlessly integrate it into their story, without falling victim of 'the dreaded info dump'.